Growing up, both sets of my grandparents lived on farms. My father’s father was very good at farming. They raised dairy cattle and farmed corn and soybeans. They kept chickens for their own consumption and raised bees as well. My grandparents kept an immaculate barn, and a beautiful machine shed, and worked very hard. My mother’s father worked hard as well, but in a really unorganized fashion. He was a lawyer first, and the farm was second in line. He and my grandmother raised beef cattle, and for one brief and terrifying period pigs (I almost got killed by a sow when I was eight or so). They also trained racehorses and farmed corn and soybeans. As a child, the farms were places that I adored. 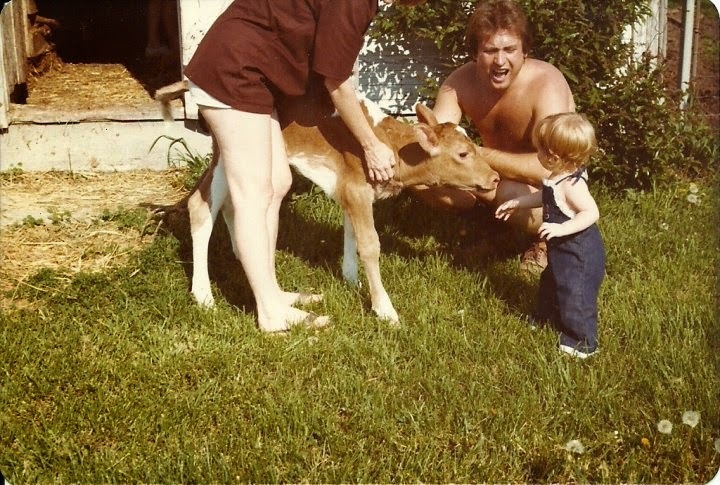 I learned so much from all of my grandparents about animals and plants. I have wandered the farms on my own and spent hours just doing nothing in the outdoors. With my father I would wander in the creek bed and bring home armloads of natural fossils that we found there. I have carried lunch out to my grandfather on the combine, climbed in and out of the silo. I have watched the auger at work (and been warned to stay far away from it). Even though I was terribly allergic to pollen, and horses, and cows…and even though racehorses can have a relatively nasty temperament…I always had a wonderful time, and I built the most wonderful memories. My mother’s mother passed away this past fall, and my husband and I went home to Indiana for the funeral. My grandmother’s funeral was at her church near the farm, and then we traveled to her hometown for her burial. Her hometown is a forty-minute drive from the farm that is traveled on a rural road that goes through farms and small farming towns. Although my thoughts during that drive were mostly of my grandmother, I could not help but notice the fields of crops as we passed through them. They were not right. Each row of corn was perfectly planted, clear of even one single weed. The corn was far taller than it should naturally grow, and every few feet an advertisement for the fertilizer that was used on that particular field stood proud and tall. If we do not stand up and stop what is happening, my memories are all that I will have left of our farms. My grandparents were doing it too, because they didn’t know any better. Our government took farmers to a point where it was impossible for them to make a decent income without employing the pesticides, and the fertilizers, and the genetically modified seeds. The land is being sucked dry, all of the bees are dying, and our food is slowly killing us. Nobody knows where their food comes from and very few people care. And I cry as I write this, because I don’t want for my farms to die. They are such beautiful places. My mother’s family farm is nestled on some of the most beautiful rolling hills in our nation. The falls there set the trees on fire, and in the spring the fields are lined with snowy dogwood. Now, my mother and my uncle are being contacted by companies that want to harvest Indiana Shale for natural gas. My father’s family farm used to be covered in honeybees that traveled from the clover to the spattering of bird’s foot tree foil that covered the ground like sprinkled sunshine. My grandfather lost his hives many years ago. I was actually afraid to explore the farm the last time that I visited…I wanted my memories to remain the way that they were. I am hoping that my intimate dismay over what is happening to our farms and to our planet might inspire just a person or two to do one small thing to help. It is not too late to save the land, it can grow back…we really and truly just need to begin to care, and we need to do it before it is too late. Is It Time To Set Our Breasts Free?